The Resurrection did not look like this. 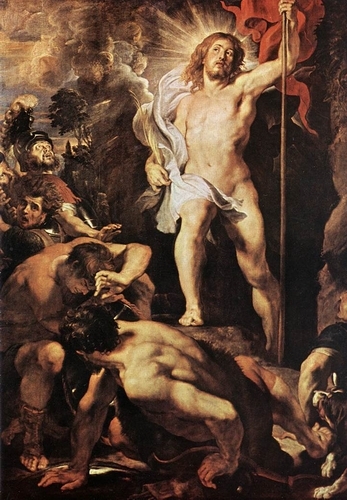 In many popular depictions of the Resurrection, the Lord Jesus comes forth from the tomb clothed in glory and splendor, while the guards fall back to the ground. Seeing the Risen Christ, all are terrified and cannot speak. This is the scene: Christ rising from an open tomb, and the Roman guards cowering to the dust. In two points, however, these artistic depictions of the Resurrection contradict the Scriptures. Last year, we considered that Christ rose from the tomb while it was still closed – in other words: Jesus walked through the walls of the sealed tomb, just as he would enter the locked upper room where the disciples had gathered. Now, we consider the fact that, when Jesus rose from the dead, none saw him in his rising. He came forth from the tomb by walking through the walls which enclosed him, but the guards did not see this. No one witnessed the Resurrection, no one fell down before the glory of the rising Lord, there was no bright light and no glorious splendor (at least none that was visible to the human eye). The night alone witnessed the rising of Christ, as the Church sings in her Easter Exultet: “O truly blessed night, which alone has merited to know the time and the hour in which Christ rose from the depths!” O vere beata nox, quae sola meruit scire tempus et horam, in qua Christus ab inferis resurrexit! Neither the guards who were on watch through the entire night, nor the women who came in the morning saw the Resurrection itself. That night alone! That most blessed of all nights! The mystery of the rising of Christ is hidden perhaps even from the angels. It is not the risen Christ which terrified the guards, but the angel. And the guards must have been terrified to realize that, though they had kept watch over the sealed tomb all night, yet the body of Christ was no longer inside! When had he risen? They had not seen it! But to the women, the angel says He is not here, for he is risen, as he said. He is risen – it has already occurred, sometime in the night. The angel does not say, “He is rising” or “Behold, he rises;” rather, He is risen. In the night, before the women arrived at the tomb, the Christ had risen from the dead. None saw him come forth from the tomb, none saw him rise – but they knew he had risen, for the tomb was now empty, though it had been sealed. In his risen body, Christ had walked through the walls of the tomb and existed, invisible to the guards! In responding to an objection – that because the day seems to start with the rising of the sun, and because Christ seems to have risen before sunrise, the Lord ought not to be said to have risen on the third day – St. Thomas considers the time of our Savior’s Resurrection. Jesus rose in the very first rays of the dawn, moments before the women had arrived. Is it fitting that none should see Christ rising from the dead? For a mystery so great, it is most fitting not that men should see the mystery directly, but that it should be revealed to them by the angels. Nor does this in any way compromise the testimony which the apostles and the other disciples have given of Christ’s Resurrection – for, although they did not see the Lord rise, they did see him risen. Moreover, of all the apostles, who has testified more compellingly of Christ’s Resurrection than St. Paul? Though he never knew Christ in his earthly life, nor did he witness the Lord rise from the dead, nor even did he see Jesus before his Ascension (for it was only by divine dispensation that the Apostle saw the Lord’s glorified body in the physical apparition on the way to Damascus); yet this Saint has been the greatest witness to the truth of Christ’s Resurrection. The apostles’ faith in the Resurrection has been passed down to us. And, though we did not see him rise, we believe him risen. Is it because of the Resurrection, because of the angels' strength, or because the quake signifies the Age of the Messiah? Or all three? Artistic representations always lack in some way, but how else is one supposed to portray it? Jesus wasn't a white guy either. That said, it is important to always make proper distinctions lest popular piety become a sort of pseudo-dogma. Happy Easter, Father! Christos anesti! A most blessed Easter to you, Fr. Reginaldus! I cannot fully express to you how much this article has touched and moved me to the depth of my being. It is only with the eyes of Faith that one sees God's mysterious action in the world. And indeed, only those who are lowly in spirit can receive and understand God's revelations. Thank you so much for all the sharings and teachings with which you have gifted us. I praise God for you! Of interest to me, though not solely as the whole post cause wonder, ponder and contemplation, is the Angel's announcement. Because, it seems to me, there is a link or parallel to the Annunciation and the Herald to the Shepherds. For, in both instances, the Angel(s) open to us the Great Mystery unfolding, of God's most Merciful Love. The key is, if I may, to be open to that Mystery. And how awesome, Holy Church preserves this "pearl of great price" in the Holy Sacrifice of The Mass. We only have to be a people of faith as St. Paul. Thank you for challenging thoughts. You are in my prayers, please pray for me. It intrigues me that Mark only mentions that it was a man, not an angel at the tomb. Is it possible that this may have been Adam? It seems clear that whether it was an angel or a human, the form was clearly a male. 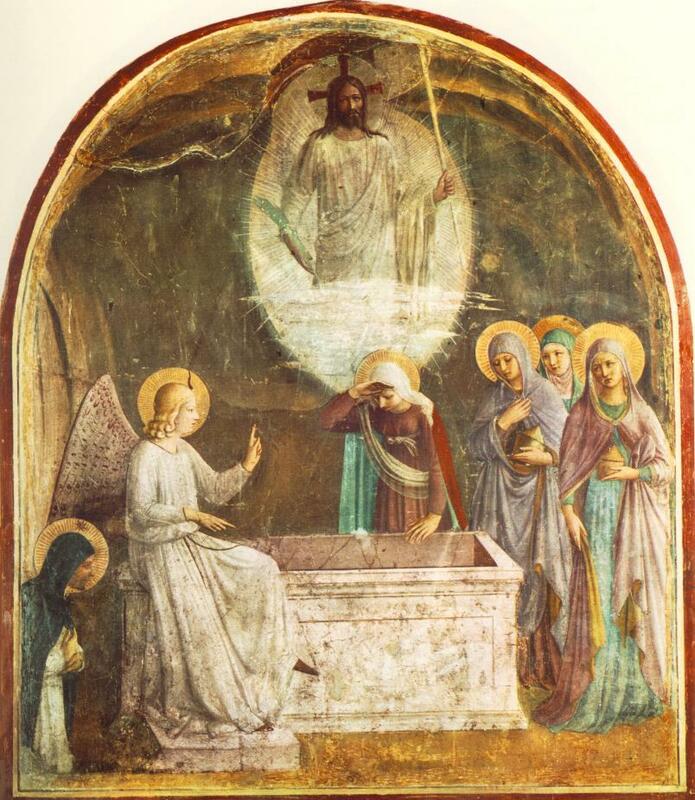 I wonder that it may in fact have been a human - transfigured, thus giving an angelic appearance - given that Matthew states that on Good Friday many of the (human) dead rose from the grave and appeared before witnesses. I wonder what your thoughts are, Reginaldus (moreover, what may have happened to those that rose on Good Friday? Where are they now?). It would seem very fitting if "the man" in Mark was, in fact, Adam. Your post mirrors my sermon for this glorious Easter morning, in spirit if not word for word! A blessed Pascha to you. Jesus appeared to His Mother, Mary, first. That is a very strong declarative statement ... I wish you had cited some authority (for example, St. Ignatius Loyola). Theology should not be presented merely as matter of personal opinion, but should be rooted in revelation and the authority of the Fathers and Doctors. In support of the position I have espoused (that Mary Magdalene was first to see the risen Lord), I did not simply give my personal opinion but instead I cited the highest authority of all -- "He appeared first to Mary Magdalene" (Mk 16:9). This passage of Scripture has been interpreted by many of the Fathers and Doctors of the Church to mean that Mary Magdalene was the first to see the risen Lord. Easter blessings to you and to all! Bernardus, I like the connection between the miraculous way Christ came forth from the Blessed Mother and that by which he came forth from the tomb -- indeed, both of these mysteries were announced by angels. However, the point about those who rose after Christ's death is well taken (it seems that this event did not occur till Easter Sunday, though Matthew relates it to us on Good Friday). I am of the opinion that this was a true bodily 'resurrection', but not a resurrection to glory (not as Christ and Mary have been glorified). Rather, it seems to have been more like what happened to Lazarus -- they were returned to earthly life. May God bless you and keep you in your wonderful teaching mission. "The Liturgical Year,' Dom Gueranger. Volume VII "Paschal Time" - "Easter Sunday" Saint-to-be Gueranger cites Tradition, beginning with St. Ambrose that Jesus appeared first to His Mother, Mary. If one went solely by Scripture, then Jesus never appeared to His Mother but did, specifically, appear to Mary Magdalen, then Salome and Mary, then Peter, then the two wayfaers towards Emmaus, then the Apostles. The reason I wrote what I did the way I did is what I wrote was, I thought, a Tautology. I have simply never known a traditional Catholic who thought otherwise. VATICAN CITY, MAY 21, 1997 (VIS) - The Holy Father focused the catechesis of today's general audience in St. Peter's Square on "Mary and the Resurrection of Christ," and recalled that "the Gospels narrate different apparitions of the Risen One, but not the meeting between Jesus and his Mother." "From this silence," he continued, "one must not deduce that Christ, after his Resurrection, did not appear to Mary." This omission might be attributed to the fact that "what is necessary for our saving knowledge is entrusted to the word of those 'who were chosen by God as witnesses,' that is, the Apostles," he said, citing the Acts of the Apostles. John Paul II asked how the Blessed Virgin, who was "present in the first community of the disciples, could have been excluded from the number of those who encountered her divine Son risen from among the dead. On the contrary, it is legitimate to think that the Mother may really have been the first person to whom the risen Jesus appeared. Could not the absence of Mary from the group of women who approached the tomb at dawn constitute an indication that she had already met Jesus?" "The unique and special nature of the presence of the Virgin at Calvary," added the Pope, "and her perfect union with the Son in his suffering on the Cross, seem to postulate a very particular participation on her part in the mystery of the Resurrection." Thank you for providing some reference for your claim ... I was aware of Ignatius of Loyola and John Paul II, but I had not yet looked at Gueranger's works. Still, I should like to emphasize that there is freedom for diversity of opinion in this matter -- you don't seem to think this. For some strange reason you think it is a "Tautology" to state "Jesus appeared first to his Mother". It is hard to understand how the statement is a self-evident tautology -- it may be true that Jesus appeared first to his Mother, but it is hardly a necessary, self-evident, analytic truth. Thank you for the various references in your later comments. Dear Father. I apologise for thinking those I run with have ideas which are universally normative. I intended no harm or insult. I can not remember who it was that explained that "He appeared first to Mary Magdalene.." refers to the first that day/morning which does not rule-out Jesus appearing to His Mother just after His Midnight resurrection. He was born at midnight (Wisdom 18; 14,15) in a Cave and, obviously, Mary was there first and, to me at least, it satisfies a spiritual balance and complimentarity that Mary would also be the first to witness his rebirth from a Cave whereas to think He did not appear to her first seems incongruent and off-putting; but, I realise that is my personal opinion. "The Great Biblical Commentary of Cornelius A Lapide (matt 28) cites Bede vis a vis Jesus appearing to His Mother, Mary, first. As to diversity of opinion on the matter, I do recognise the legitimacy of it and the reason I seem not to is the curt and aggressive way I write. So, I apologise for that, Father. In any case, thank you for all those great references. If you are reading Fr. Cornelius a' Lapide and Abbot Gueranger, you are doing well! I hope you will continue to read and comment freely here at NTM ... I especially hope you will join in on the conversation when the future article on whether Jesus appeared to his Mother is posted. I sometimes wonder if Our Lord had His Mother in mind when he said to St Thomas, "...blessed are they that have not seen, and have believed." Dear Father. You are kind and generous Thank-you. I can't remember who directed me to this Blog but I am glad they did. For your readers who have not read Dom Gueranger's , "The Liturgical Year," (TLY) they do not know what they are missing. He is so alive to me and TLY is an absolute joy to read and it is a Treasure Chest over-flowing with beauty, sanctity, authentic ecclesiastical history, and rock-solid exegesis. And the hymns and selections from Ancient Missals he selects. Wow. Thanks to him, I begin every day of this Paschal Time by praying "Aurora coelum purpurat..." from the Office of Lauds. Hearing "hell howl with fear rage..." is early morning music that ought be heard by every set of ears on every single Church Militant. That, and not Good Morning America or "All Things Considered" is the way to begin a day. There is indeed much to consider! "Give praise, O Mother, to thy risen Jesus, who reigns triumphant over the price of death. Cease they mourning; for Jesus, the fruit of womb, is restored to life, and visits thee...."
Dom Gueranger, Thursday in Easter Week, "After Mary - in whom the light of faith never waned, and to whom, as the sinless Mother was due the first manifestation - who were the first to be illumined with that faith whereby the Church lives? Magdalen and her companions..."
In fact, I am working on a response right now! But consider this, dear Reader: Most scholars date the writing of the first gospel, Mark, as circa 70 AD. Who of the eyewitnesses to the death of Jesus and the alleged events after his death were still alive in 70 AD? That is four decades after Jesus' death. During that time period, tens of thousands of people living in Palestine were killed in the Jewish-Roman wars of the mid and late 60's, culminating in the destruction of Jerusalem. Your comment shows that you don't really understand anything of the traditional Christian beliefs regarding the authorship of the Gospels. You state that most Christians assume that "eyewitness wrote the Gospels"... um, no. Actually, we don't assume that. In fact, we have always maintained that St Mark and St Luke were not eyewitnesses to the events they record. As to the rest of your comment, it smacks of that bigotry which presumes that what heretics thought up in the past 100 years is automatically better that what the saints preached for 2,000 years, simply because the recent heretics happen to live closer that that golden age of your own existence.